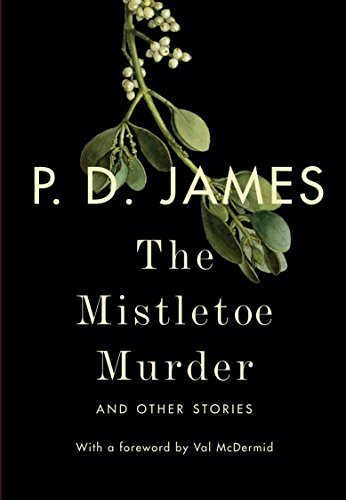 This anthology of short stories, The Mistletoe Murder, is a collection of four short stories by P. D. James. Each of these stories is fun and Agatha-Christie-esque in its structure and appeal. Each story is about 40 pages in all, making this a book that can easily be read in one or two sittings on a cool autumn evening with a cup of tea close at hand. The title story, “The Mistletoe Murder,” takes the reader back over six decades to recount, in first person, a murder that occurred over the Christmas holidays in a remote family estate where a particularly unlikeable cousin is murdered. The first person protagonist takes it upon herself to investigate the circumstances but waits for over 60 years to divulge the truth. There are few characters, thus few suspects, and divergent clues that align to make it difficult to determine who really committed the crime. Not to divulge the details, suffice to say that the ending provides a unique twist, unexpected, yet still rewarding. The second story, “A Very Commonplace Murder,” is another tale told in background scenes. The murder in question occurred 16 years earlier, and the main character, Ernest Gabriel, finds himself at the home where he previously witnessed the crime. As the story unfolds, we find that Gabriel is not a particularly likeable character with an unethical sense of right and wrong. Yet he takes us through the events as they unfolded including attending the trial of the adulterous young man who was charged with killing his married lover, and upon being found guilty, he is subsequently executed for the crime. It would be quite simple if that were the end of the story, and yet it is not. The final explanation comes to us out of left field, and explains a lot about Ernest Gabriel and his failure to come forward. This is a story ending that makes us put down the book for just a moment, and laugh that we did not see this coming. The last two stories feature James’s popular detective, Adam Dalgliesh. Anyone familiar with James’ hero will enjoy both stories and how James moves her successful hero through the clues set before him to quickly unravel the crime. In “The Boxdale Inheritance,” Dalgliesh is asked by his Godfather, Canon Hubert Boxdale, to wander through the maze of a crime committed at the turn of the century. Great Aunt Allie’s substantial estate comes to Canon Boxdale, and yet the truth of her inheritance sixty-seven years earlier weighs heavily on his conscience and he feels a moral responsibility to know if her inheritance was ill gained. In 1902, Allegra Boxdale, young, pretty, and outgoing, was charged with murdering her elderly husband. The trial wound its way through the English system, and in the end Great Aunt Allie was found not guilty. But the questions remained and followed her throughout her life until she died, and her inheritance passed through the family down to Marguerite Goddard, her stepdaughter. Upon Marguerite’s impending death, Canon became the next to inherit. Being a man of strong moral character, this inheritance weighs heavily on his conscience. As Dalgliesh reopens the 67-year-old case, facts begin to fall into place, and with the characteristic Christie-esque twist, Dalgliesh raises the truth to the top, but as he assures the Canon that the money was not ill gained, he keeps details to himself and reburies the truth. In “The Twelve Clues of Christmas,” James once again brings Adam Dalgliesh into a death scene that appears to be a suicide, but clearly becomes a case of murder once the clues are placed in order. Although this story also has a twist at the end, it is not perhaps the most startling twist of the four stories. Suffice to say, the best-laid plans of suicide are not always what they seem, and Dalgliesh successfully identifies the truth. This is a small book and would make a marvelous holiday present for anyone who loves to read and enjoys a twist at the end of a story. Definitely belongs on the bookshelf.